At Conferences UK, we source conference venues all over the United Kingdom. Our mission is to provide the best properties for a variety of conferences. Today we're taking a look at our top picks for Milton Keynes conference centres and Nottingham conference centres. Without further ado, here's our list of some of the best venues available for your next meeting or conference. Nottingham 1. Eastwood Hall Principal Hayley Hotels & Conference Venues Eastwood Hall provides a diverse selection of meeting rooms. Each conference room is designed to promote better learning opportunities for your team. Quiet with plenty of natural daylight, this venue offers up to 320 maximum capacity and a close location to the East Midlands airport. There's also plenty of parking and accommodation available. 2. Crown Plaza The Crown Plaza Nottingham is a green venue that offers up a capacity of some 400 people. Ideal for large meetings and training conferences, The Plaza has 17 high-quality boardrooms, a first-floor tree atrium and a glass ceiling. It's located just 1 mile from the Nottingham train station and 13 miles from the Midlands airport. 3. Belton Woods Ideal as a training centre, the Belton Woods is an excellent location for your next conference. Positioned on 475 acres of Lincolnshire countryside, the Belton Woods is a gorgeous property that offers a fun and entertaining setting. The property offers 13 meeting rooms and a 370-person capacity. 4. Albert Hall Conference Centre Nottingham Albert Hall Conference Centre is located in the heart of Britain's communication network. Easy to access via road, rail or air, the centre is the perfect place for any exhibition or training course. Built at the cusp of the 20th century, the hall is both aesthetically pleasing and updated with modern features. It is tailored for clients of all backgrounds. 5. Nottingham Conferences Nottingham Conference provides three conference venues that are extremely flexible and ideal for meetings, conferences, and events. The venues are supported with state-of-the-art visual technology. It has a max capacity of 520 with a total of 8 meeting rooms. It is also based on one of the world's top universities and has award-winning campus facilities to take advantage of. Ideally located, this is a great venue option if you're looking for something a bit larger. 6. East Midlands Conference Centre The East Midlands conference centre is positioned on 330 acres of The University of Nottingham's premium landscaped park property. It is perfect for either small events with as few as 10 people to large events with up to 588 attendees. Transport is also easy with quick access to road, air and rail. 7. Park Plaza Nottingham If you're looking for more space, the Park Plaza Nottingham conference centre is the place to go. Located inside a four-star Nottingham hotel, the Park Plaza sits inside of the city's entertainment district. With the Sherwood Forest nearby, easy transport links with the Motorway and East Midlands Airport, and a capacity of up to 220 guests, this is the spot for larger conferences or meetings. Natural decor, plenty of natural light, and Wi-Fi access throughout it has everything you need for a killer event. 8. Scalford Hall Scalford Hall provides plenty of space located inside of a stunning country house. Perfect for modern events thanks to modern facilities, it is the spot to go for experiential learning and team building. It also has a recently upgraded Pavilion venue and banquet space for catering. Milton Keynes 9. Jurys Inn If you're looking for a Milton Keynes conference centre with an ideal location from the central train and bus station, then look no further than the Jurys Inn. We like it because of its location, but you might like it because of its fully refurbished hotel and 13 fully equipped modern meeting rooms. Stylish and comfortable, they have everything from a 400-capacity theatre to a smaller room holding 50 or fewer guests. 10. Milton Keynes Theatre As one of the most successful regional theatres, the Milton Keynes Theatre is a hot spot for large conferences. The main theatre ceiling can be raised opening up to a capacity of 1,400 people. It is also located just 5 minutes from the railway station. There's also smaller spaces such as reception rooms that are available for smaller events or meetings. 11. DoubleTree By Hilton Stadium MK The Double Tree is a loved hotel for many reasons, but the Double Tree by Hilton Stadium MK is a 4-star hotel that offers up to 27 meeting rooms with a maximum capacity of up to 1000 people. It also provides free Wi-Fi and free car parking for some 1800 vehicles. It's the ideal spot for large meetings and conferences. 12. Woburn Conference Centre and Golf Club The Woburn Conference Centre and Golf Club has everything you need for your next meeting or conference. This includes a fully stocked bar and a premium restaurant that has all the food you need. Informal meetings are also well served at the conference centre. 13. MKCC The MKCC offers individuals looking for the best conference venues in Milton Keynes everything they need. It has a main auditorium that holds some 550 seats. It has the best technical facilities available along with audiovisual lighting equipment. Smaller spaces are also available to seat up to 180 individuals. 14. Ramada Encore Milton Keynes This event centre has two meeting rooms on site. A first-floor venue has modern meeting rooms and comfort to guarantee a smoothly run conference or meeting. The second, provides overhead projectors, TVs, and videos along with box stationary and 24-hour booking flexibility. 15. Cranfield Management Development Centre Bedfordshire Individuals who prefer comfort and service will thoroughly enjoy the Cranfield Management Development Centre in Bedfordshire. Just 8 miles from Central Milton Keynes and 10 miles from Bedford, it's in the centre of the city. There is also an airfield on site for those conferences that need it. First-class comfort is the top priority as well. If any of the above conference venues sound good to you, then connect with us. 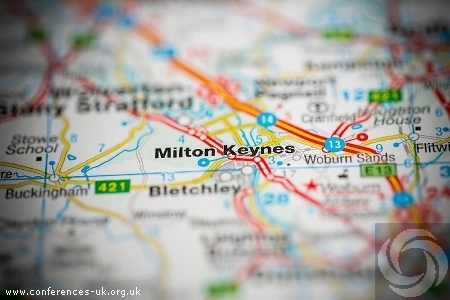 We can help you find the best Milton Keynes conference centre or Nottingham conference centre for your needs.